This week’s Paparazzi Proposal was dark, secretive, and romantic as ever. 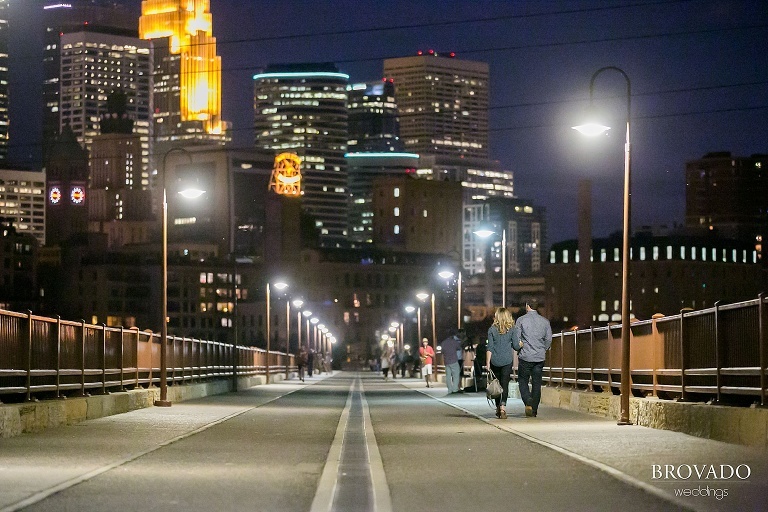 Cody wanted to propose to Mallory on the Stone Arch Bridge, at night, overlooking the Mississippi river with the city lights of downtown Minneapolis ablaze in the background. 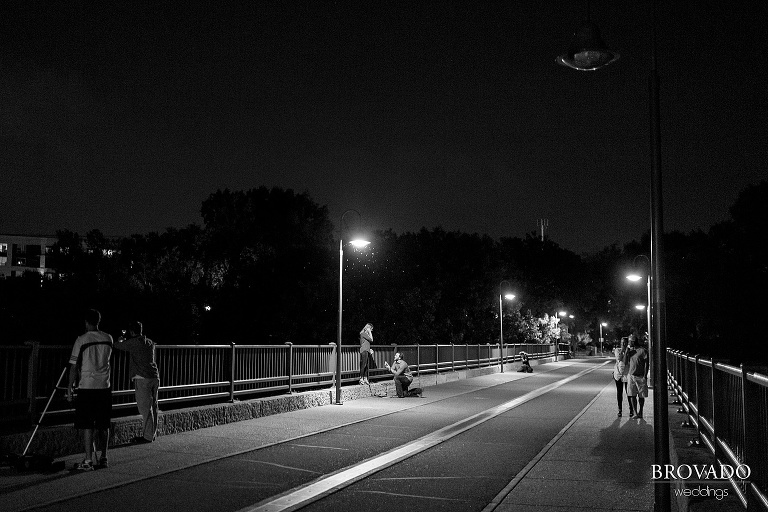 It was such a perfect summer night… all the plans were in place, and I had a great (secret) vantage point a few yards away. 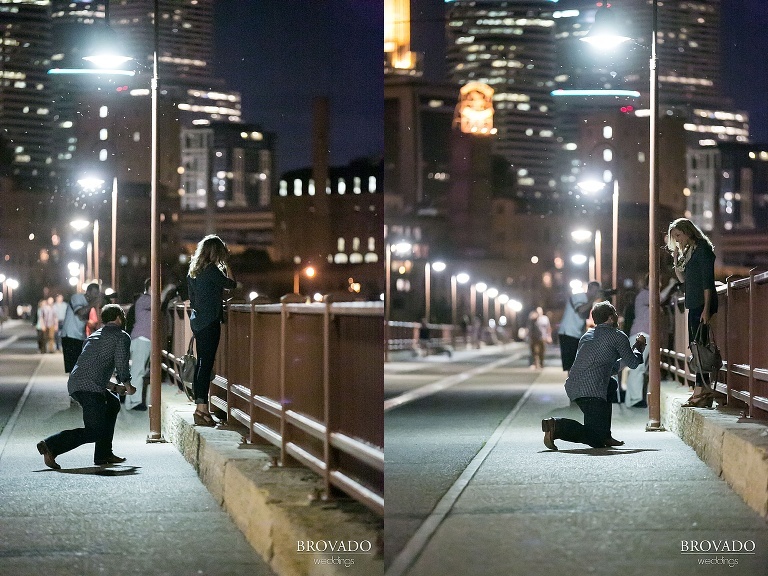 Because it was so dark, Cody and I had to strategize beforehand about how to get Mallory placed directly under a street lamp when he popped the question, so that she would be illuminated and I could still capture her reaction in the moment with my camera. I have pretty nice equipment, but even today’s technology needs some light to work with! Once she was in place, Cody directed her attention to the river, and as she was looking over the railing of the bridge, he positioned himself behind her so that eventually she turned around to see him on one knee with a ring in his hand. It was absolutely perfect! And what’s more, she said yes! After a few sweet moments of hugs, kisses, and some happy tears, Cody pointed me out and the couple posed for a few more photographs. The whole night couldn’t have gone more smoothly. Great work, Cody! Thank you for allowing me to be a part of your surprise! **If you would like to book one of these proposal photo sessions, please contact Paparazzi Proposals at 1-888-287-5120, ask for James, and tell him you want me (Preston Palmer with Brovado Weddings) as your photographer.